Ariosto was born in Aquem, Goa, Estado da India Portuguêsa in 1950 and christened José Agnelo Jeronimo Ariosto Xavier do Rosario Coelho a week later on October 7 at Our Lady of the Rosary Parish Church in Navelim. He became a de facto citizen of India in 1961 and accepted citizenship of the U.S.A. in 1999. • Dr. Coelho has an extensive educational background and is the recipient of many fellowships. He earned Master's degrees in Hindi Literature, Divinity, Spiritual Theology, Pastoral Studies, Family Psychotherapy and Art Therapy from major universities in India, Italy and the U.S.A. In 1993, he was awarded a Ph.D. in Philosophy and Religion by the Trustees and Faculty of the California Institute of Integral Studies in San Francisco. 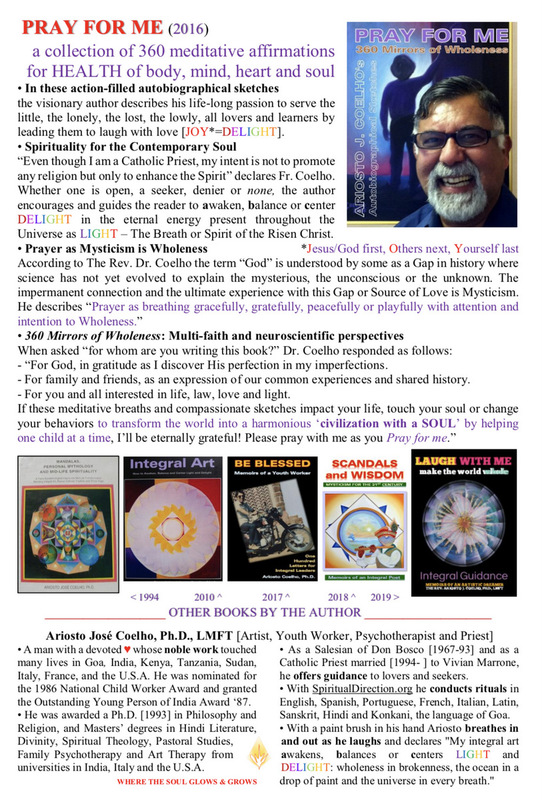 • His doctoral research was published in 1994 as Mandalas, personal mythology and mid-life spirituality: A trans-epistemological inquiry into mid-life transformation blending integral art, Roman Catholic tradition and Pūrna yoga, and was introduced by P. R. Dubashi, Ph.D., D.Litt., Vice-Chancellor, Goa University, as a "highly reflective ... mystical note ... woven around one of the richest symbols in Hindu mythology." • As an Educator, Social Worker and Artist, Br. Coelho was effectively engaged in educational and social work in Tamilnadu, Maharashtra, Karnataka, Gujarat and Goa. He taught Math, Hindi, Latin and Morals in Don Bosco Institutions: High Schools, Boardings and Youth Centers. Throughout his years as a Salesian in India, Ariosto exhibited his art regularly in the Communities where he worked and at major exhibitions in Chennai, Bangalore, Mumbai and Goa. • As a Salesian Priest [1977-94] Fr. Coelho worked in the Roman Catholic Archdioceses of Goa, Rome and San Francisco. In 1994 he chose to marry Vivian Elizabeth Marrone and is associated with the White Robed Monks of Saint Benedict in San Francisco, California. As a Contemporary Catholic Priest he ministers to individuals, couples, families, groups and communities. He has coached hundreds of couples and performed over 1000 personalized wedding ceremonies. • In his capacity as the Vice-Rector (1978-81) and Rector (1981-87) of a community of Salesians in Sulcorna, Goa India, Fr. Coelho was instrumental in transforming Don Bosco Farm into an Agro-Educational Complex [DBAEC]. He founded and established the Don Bosco Farm High School which was inaugurated by Dr. Gopal Singh, the Governor of Goa, in 1986. Today, the DBAEC manages Goa's first and only Agricultural College. • For his outstanding work on behalf of the little, the lowly, the lonely and the lost in Sulcorna, Goa, Fr. Ariosto Coelho was nominated by Shri Francisco Sardinha, Cabinet Minister of the Government of Goa, India, for the 1986 National Child Worker Award. In 1987 he was awarded the Outstanding Young Person of India Award by the Goa State Jaycees. • As a Trustee of 'The Bombay Salesian Society' and a Councilor to Fr. Chrysanthus Saldanha, the Salesian Provincial of Bombay (1982-88), Fr. Coelho held a number of responsibilities in the governance and development of the Salesian Institutions in Western and Central India, particularly in the Goa and Gujarat regions. He provided leadership to the Salesian Province of Bombay and support to the Salesian Delegation of Kenya, Tanzania and Sudan in East Africa led by Fr. Tony D'Souza, SDB. He collaborated with Don Egidio Viganò, SDB, the Rector Major [1978-95], and his Council in Rome in the mission of evangelizing the young. • In 2010 the Board of Supervisors of San Mateo County recognized Ariosto Coelho, LMFT, for serving youth and families in California for over ten years as a Licensed Marriage and Family Psychotherapist. On his retirement day, April 1, 2015, the Leadership of Behavioral Health and Recovery Services recognized him and "the excellent work he provided to the communities of San Mateo County for 15 years." Today, as President of SpiritualDirection.org "where the soul glows and grows," The Rev. Dr. Ariosto J. Coelho offers guidance to the little, the lowly, the lonely, the lousy, all learners, lovers and their leaders and conducts rituals in English, Spanish, Portuguese, French, Italian, Latin, Sanskrit, Hindi and Konkani. With a paint brush in his hand he laughs as he declares, "My integral art Awakens, Balances or Centers Light and Delight, wholeness in brokenness, the ocean in a drop of paint and the universe in every breath." Coelho, Ariosto J. 1993. Mandalas within-beyond life: A phenomenological investigation into life and revelation as gifts unfolding-enfolding! Ann Arbor: UMI Dissertation Services. Roman Catholic tradition and Pūrna yoga. Aquem-Goa: Moima Publications. ___. 1995-97. The ACD [Airport Communications Dispatchers] Training Manual. (SFIA Operations, San Francisco, CA). ___. 2010. Integral Art: How to Awaken, Balance and Center Light and Delight - Drawings and Paintings of Soul Travel. ___. 1983-87. From the Rector's Desk in The Song of Sulcorna & Sulkornachem Songeet: Annual of Don Bosco Agro-Educational Complex. Sulcorna Goa, India. ___. 1997-2006. Weekly Pastoral Messages in The Sunday Bulletin of St. John's 1928 Book of Common Prayer Parish. Hayward CA, U.S.A.
___. 2000-03. From Executive Director's Desk in Cedar: Newsletter of Convalescent Hospital Ministry of Santa Clara Valley. Campbell CA, U.S.A.
___. 2003. From Editor's Desk in Goa Sudharop: Newsletter of Goa Sudharop Community Development, Inc. Berkeley CA, U.S.A.
___. 1973-74. Artwork & layout for Youngsters: A Don Bosco Publication. Bombay. ___. 1984-85. Articles in Renovação: Newsletter of the Archdiocese of Goa. Panaji. in International Journal of Philosophy, Psychology and Spirituality, 1. no.1 (1992). pp.38-39. ___. 1995. AThe Creative Cosmic Clowns. @ in Joy L. Esterby, ed. At Water=s Edge. The National Library of Poetry, Owings Mills. 1995..
___. 1996. AOh Mirror@ in The Bohemian. (A Literary Magazine, College of Notre Dame. Belmont.) April 1996. p.22. ___. 1996. ASparks of Recognition@ and ANothing Without Your Grace. @ Poems in Christus Rex. (A Parochial Bulletin, Christ Church. San Mateo.) April 1996. ___. 2007. "Empathetic detachment: A key to the healing alliance in parent-child relationships." in Psychological Foundations -The Journal, Vol IX (1). ___. 1976. "Rahasyavād or mysticism in the writings of Kabirdas: A critical paper in Hindi literature.” (Sahitya Sammelan, Allahabad, India). A contribution to vocation spirituality.” (Pontificia Sudiorum Universitas Salesiana, Rome, Italy). ___. 1997. "The aging population and the experience of life satisfaction: A phenomenological paper in clinical art therapy." (College of Notre Dame, Belmont, CA). ___. 2008. "No better gift: Spiritual direction with the rhythm of the breath." (Moima Ashram, San Bruno, CA). ___. 2016. "Pray for me: Autobiographical Sketches. 360 Mirrors of Wholeness." (Spiritual Direction, San Bruno, CA). ___. 2017. "Be Blessed: Memoirs of a Youth Worker. 100 Letters for Integral Leaders." (Spiritual Direction, San Bruno, CA). ___. 2017. Scandals and Wisdom of a Married Priest: Memoirs of an Integral Poet." (Spiritual Direction, San Bruno, CA).